Not that it's a dumb show by any stretch of the imagination, but it's a bit odd nowadays to reflect that Doctor Who was created as educational TV. Hence the original two companions (apart from Susan, who was just there to look cute), Ian and Barbara - science teacher and history teacher respectively, there to provide exposition for the audience as the TARDIS alternated between Earth's past, showing moments in history, and the future, exploring scientific ideas. Of course, having a guy play a scientist doesn't equate to knowing about science, which is what the show's producers desperately needed to do when they realised that viewers were getting a bit disinterested in the history side of things. Script editor Barry Letts set about doing the rounds of any boffins in the vicinity with time on their hands - gauging their potential by asking them to describe how the Post Office Tower (a newly-completed edifice at the time, and later to become the inspiration for Hyperdrive's starship HMS Camden Lock) might take over the world. The only promising answer came from Kit Pedler - said answer became season three's "The War Machines" - who had a bit of a thing about cybernetics. I think you can see where this is going. "Our brains were once just like yours, except that certain weaknesses have been removed." "You call them emotions, do you not?" Pedler, a surgeon by trade, was well-placed to know about the emerging field of cybernetics, and wondered what the result would be of a human replacing so much of themselves that they became (as Alec Guinness would later put it) more machine than man. He also evidently wondered what it would be like if Doctor Who had an enormous budget - his original description of his Cybermen in "The Tenth Planet" had them as identical-looking sveen-foot-tall men with metal scalps beneath their hair, artificial organ units built into their chests, exoskeletons, and living human hands on the end of transparent forearms with hydraulic pistons inside. Sandra Reid, the show's costume designer, didn't have a CGI suite tucked away in her office, but if what she turned out looks a bit hokey now, consider what she had to work with back in 1966. 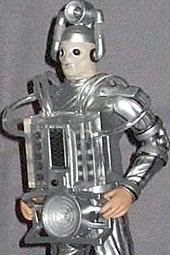 The "Mondasian" Cyberman (named after their homeworld Mondas, once Earth's twin - and the Mondasians parallel-evolved humans - that drifted out of orbit and into deep space, necessitating its inhabitants modify themselves to survive) is quite different from all the Cybermen who followed, but the genesis of their design is there: the silver suit, the chest unit, the "jug handle" antennae. Pedler's ideas filter through as well, in forms the cash-strapped show could afford, with metal scalp plates, metal bands around the limbs suggesting an exoskeleton, and of course the human hands; that bit was easy enough. The figure has a surprising amount of detail to capture, but does it well. The bodysuit is loose and heavily creased, bunched around the bands fixed over the joints. Over the silver base there are dark bands painted on, the ends of which bleed onto the bands here and there, but not so much that it's obvious at a glance. The chest unit sports the most detail, with a silver and black sculpted interior beneath the clear casing, and clear tubes running from it into the shoulders, both above and beneath the metal plates there. The tubes are soft plastic, although the chest unit can't move in relation to the shoulders - it's just a matter of getting the look right. Beneath the main unit - the Cyberman's organs - is the bulky dish-like gadget which turns out to be a weapon. The face is, quite obviously, cloth stretched over the actor's face (including their jaws moving when they talked, which was more than a bit creepy, in fact) - in the aired episode they were quite smooth, but the action figure sculpt takes things a little further, adding a gaunt, skull-like form around the eye sockets and jaw that the real thing never had to this extent. It looks decidedly unsettling though - like parts of the head underneath have been removed. True to form (reconstructed from photos and accounts from the time - the episode was broadcast in black and white) the hood is a soft off-white, rather than silver like the rest of the costume. The eyes and mouth are outlined in silver, and painted in black and pale pink respectively. The big dish atop the head - this one a power receiver, tuned to Mondas's power broadcast stations - are tilted backwards slightly, as they were in the episode, mainly since there was no way to fix them firmly in place. The middle part of the antennae is clear plastic, again accurate to the real costumes. Despite the bulky chest unit, the body has all the regular Doctor Who joints, though it doesn't exceed the basic specs as some figures in the line have done. Swivel neck, swivel shoulders and biceps, peg elbows, swivel wrists, swivel waist, swivel/pin hips, peg knees, and swivel boot tops. The legs are somewhat limited, lacking thigh swivels, and the sculpt of the hip piece prevents them from swinging backwards. No matter really - weighed down by all that junk (and often beset by an artificial snowstorm on the soundstage filling in for Antarctica), the actors inside the suits were considerably less than fleet of foot. Although the dish weapon isn't detachable from the chest unit, the arm articulation does permit the hands to hold it, although a tiny bit of bending of the soft handles is necessary to keep them there. With no accessories of his own, the Cyberman (who may be named Krang, Talon, Gern, or Jarl - the first and last time regular Cybermen had individual names) has just his BAF bit to keep him company: the head of the Cyber Controller featured in "Tomb of the Cybermen." Despite its enlarged cranium, it's hardly the world's biggest Build-A-Figure bit - the Controller, spread across the four-figure Cyberman set, isn't meant to be that much bigger than his subordinates, after all. 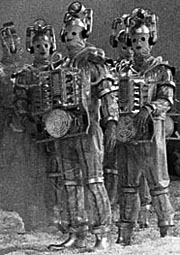 "The Tenth Planet" is unfortunately one of the old Doctor Who serials that didn't survive the BBC's tendency to wipe and re-use its old tapes - although faring better than some, which are missing in their entirety, the fourth of its four episodes survives only as a soundtrack (recorded live off the TV by dedicated fans), still images (likewise photographed off the TV), and several short 8mm clips (fans again, bless them). Besides introducing one of the show's greatest villains, the serial featured the first ever regeneration - thankfully captured in one of the surviving clips - an unanticipated development resulting from William Hartnell's failing health; frankly, no-one had expected the show to last for years when they cast him anyway. With his bulky, ungainly costume, and odd features like the bare hands and cloth-covered head, the Cyberman looks strange even next to his own relatives from later serials (never mind today's versions), but he's a genuine piece of the show's history. Any collector of classic Doctor Who figures ought to want this one, and they won't be disappointed if they get him.